These are truly formidable troops whose task it is to guard the army's general. 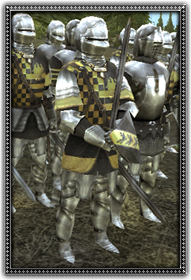 Wearing plate armour and wielding swords, these elite troops fear little on the battlefield and make fearsome opponents. Loyal and disciplined this elite heavy infantry unit accompanies the general wherever he goes on the battlefield.